Temporal data can be implemented in the linear referencing system (LRS). The LRS is said to be time aware because everything in the linear referencing system, from routes and events to route calibration, respects time. A route is a representation of a linear facility (for example, a highway) at a specific date and time. When you locate events on a route, only the events that were active as of the date and time the route was active will display. The measure values on the route reflect the way the route was measured at that date and time, which may be different from the way the route is measured today. This allows you to set a specific date and time for each route, and each event layer, and see them as they were then. You can also add layers to your map with different time periods set so you can compare the past, present, and future. Each representation of the network and its associated event layers is based on a temporal view date (TVD) set by the user within an ArcMap session. The TVD tells ArcMap how to render the feature and what events to display. The example above shows a highway both before and after a roundabout (traffic circle) has been constructed. The roundabout not only adds length to the highway system, which changes the measure values, it also changes the collection of assets that are associated with the highway. In this case, the 2005 version of the highway was 4.2 miles with a standard T-intersection controlled by stop signs. The 2010 version is 4.5 miles with a roundabout controlled by yield signs. The temporal view date (TVD) is a property of the map layer in ArcMap. In order to set the TVD, browse to the ALRS tab on the Layer Properties dialog box. 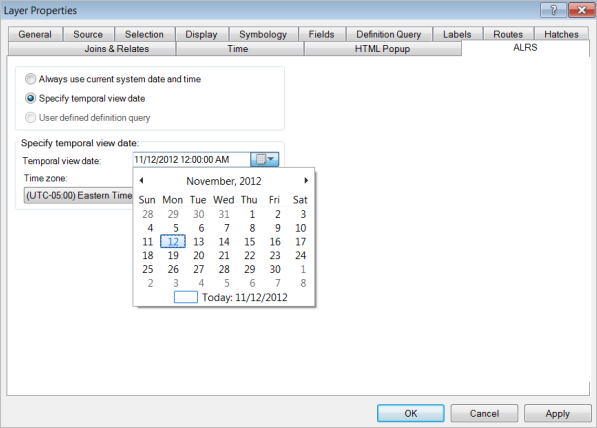 You can choose to apply the current system date and time or use the interactive date picker to choose a specific TVD. 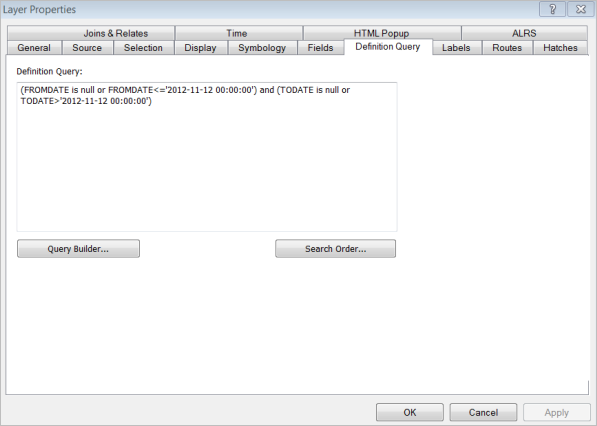 By default, the current system date and time are automatically applied to the layer after it is added to the map. When setting the TVD of LRS Networks, a definition query is automatically applied to the layer. You can manually edit the TVD definition query on the Definition Query tab. You can clear definition filters for LRS layers using the Set Date Filter tool provided in the Roads And Highways Editing toolbar. By setting the TVD for events to different dates, you can easily visualize how events have changed over time. All events have from and to dates associated with them. 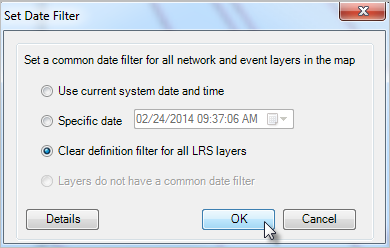 Esri Roads and Highways manages these dates for you when LRS Networks are updated. When you set the TVD for both routes and events, you can view the routes at a specific date and time. You can also add LRS Networks and event layers to your map multiple times to provide multiple date/time representations. Thus, it would be easy to visualize the change in the frequency of crashes when pavement conditions improve or degrade. ArcGIS Desktop allows you to work with time-enabled layers outside of the platform using ArcMap or the various web client APIs for Roads and Highways for Server . While temporal route edits should be made using the editing tools, your LRS can be used in conjunction with existing tools that work with time-enabled layers, such as the time slider. To view time-enabled data using built-in ArcGIS Desktop functionality, you must remove all TVD definition queries from your layers. To use time-enabled edits in the Event Editor, you must remove all TVD definition queries from your layers prior to publishing your map service. For more information, see Setting the time view for LRS data. 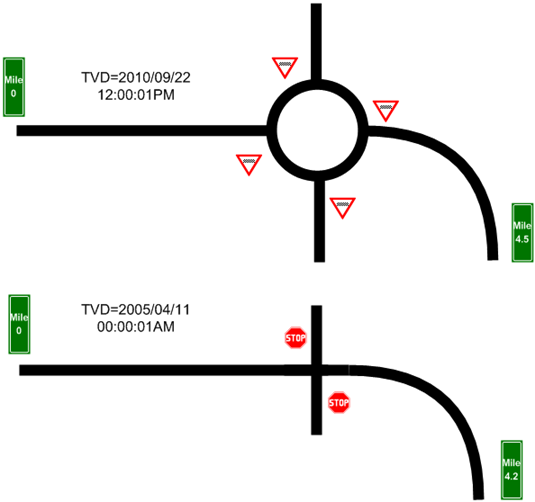 Routes must be edited using a TVD that is more recent than the actual date of the change in the system. Typically, an edit would be made to data based on something that has already occurred in the real world in the past. For example, an edit made on January 30, 2015, would most likely reflect a change to the route that actually occurred sometime the previous year. To edit changes that occurred in the past, it is not necessary to do anything out of the ordinary. Ensure that the TVD is set to use the current system time and start editing. This allows you to make edits out of chronological sequence. It is preferable, however, to enter changes to the highway system before they are actually open to traffic. The ability to add planned roads allows you to ensure that the most current data is in the database at all times. If you know that a road is going to be constructed at some future time, set the TVD to a future time that is later than the planned alignment and begin editing.